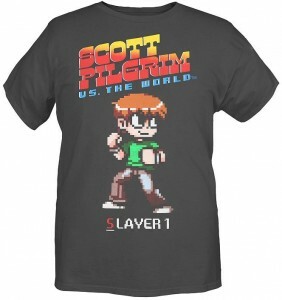 Mighty Fine is doing a whole line of Scott Pilgrim t-shirts. I wish I had something witty to say, but I can’t because I used all my power ups on that opening paragraph, not to mention fighting the urge to use the companies name as a pun to talk about the shirt. I wish I had a better way to start this review than just saying this is an awesome shirt. It’s made out of a really nice soft material. It makes me think back to pajamas as a kid. It’s a really soft material, but it doesn’t feel overly fluffy. It gives the shirt a really nice feel to it and it’s really comfortable. It’s the type of shirt that you can easily imagine keeping around the house as just a comfortable thing to throw on or wear it to bed. I can’t say enough good things about the material itself. The images themselves are silk-screened on. The colors are all bright and bold and very vivid. 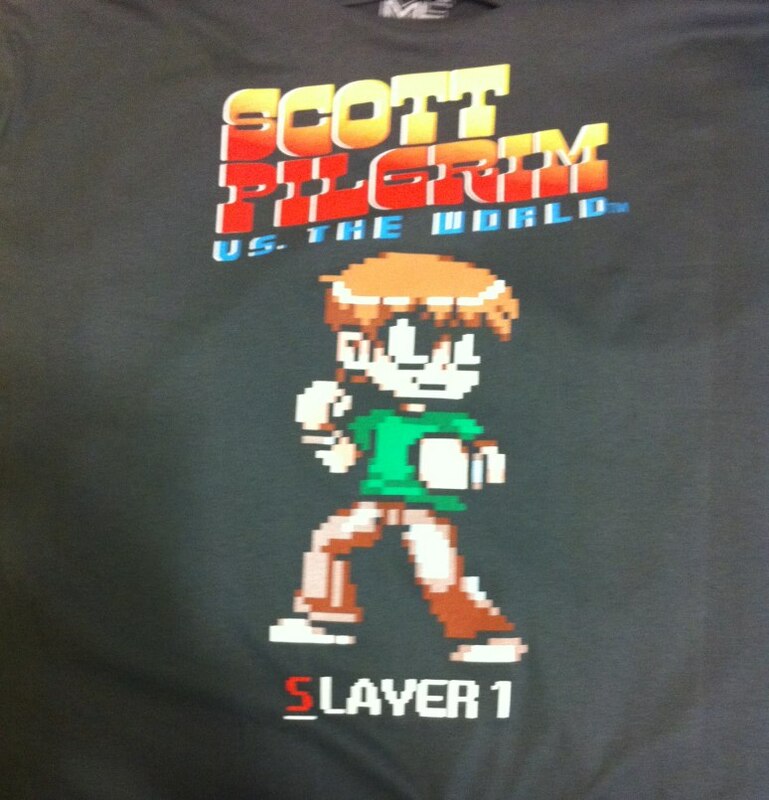 The primary image of the shirt is Scott from the upcoming video game in his default pose. It’s a good image if a bit ‘basic’. One nice touch is that the outline isn’t silk-screened onto the shirt. The outline is the shirt itself. It likely won’t be noticed by many people, but I just found that a really awesome touch that integrates the image into the shirt really well. 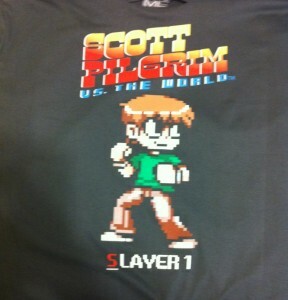 The video game version of the logo (and the Slayer 1 text) is silk-screened on just as nicely and adds some flair. Although you do have to wonder if any Scott Pilgrim fan would need to see the logo to know what it is. The logo may have worked better printed small on the back (the back of the shirt doesn’t have anything on it) although I’ve never been sure if I liked stuff on the back of shirts or not when it isn’t needed. The shirt doesn’t have a tag to scratch or annoy you; everything is printed on the inside of the shirt. 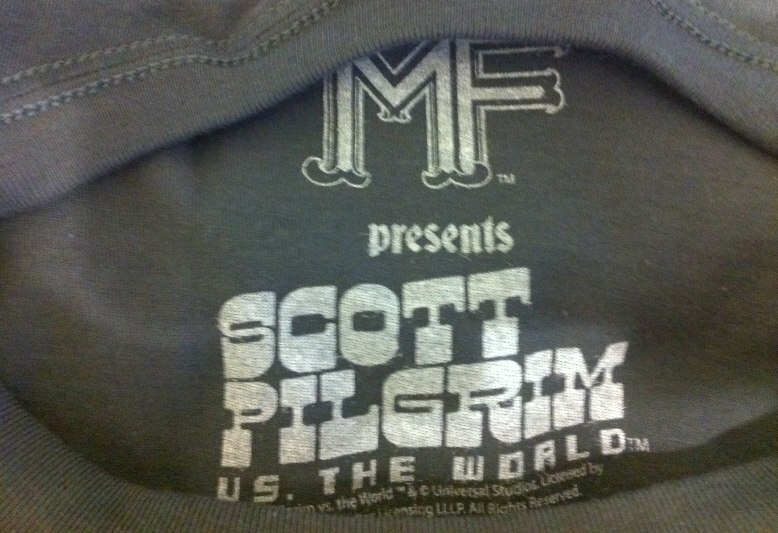 Washing instructions, size, everything is there; even a Scott Pilgrim logo. It’s a nice touch to add to the shirt. Not gonna go with grades this time around because it seems a bit to weird to have grades for ‘material, printing, etc’, but I’d definitely give the shirt an A. B+ if you think Scott’s pose is a bit to vanilla.. This t-shirt will be available through Hot Topic and We Love Fine. Perhaps we will be lucky and there will be a Scott Pilgrim related contest soon. ‘wink’ ‘nudge’ ‘poke in the eye’ No promises though. Copyright information under ad. This shirt was reviewed using a screener. Reviewing a shirt was kind of weird but it was fun. Movie can’t come soon enough. Make sure you go see it. Also… is it called a screener when it’s a shirt? I mean… DVDs are called screeners when you get them to review them. What is a shirt for review called? Is there some sort of terminology or is just a ‘shirt for review’? 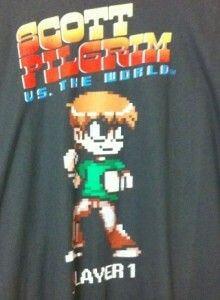 Scott Pilgrim vs. the World™ & © Universal Studios. Licensed by Universal Studios Licensing. All Rights Reserved. This entry was posted in Feature, Reviews and tagged Comics, Game, Mighty Fine, Movie, Scott Pilgrim, Scott Pilgrim Versus The World, Scott Pilgrim Vs. The World, Shirt, T-Shirt on July 26, 2010 by Marc.